Numerous members of Colorado's Division of Homeland Security and Emergency Management (DHSEM) mobilized their expertise and experience to help with the massive responses to hurricanes Harvey and Irma in September. Jeremy Utter at the National Response Coordination Center. 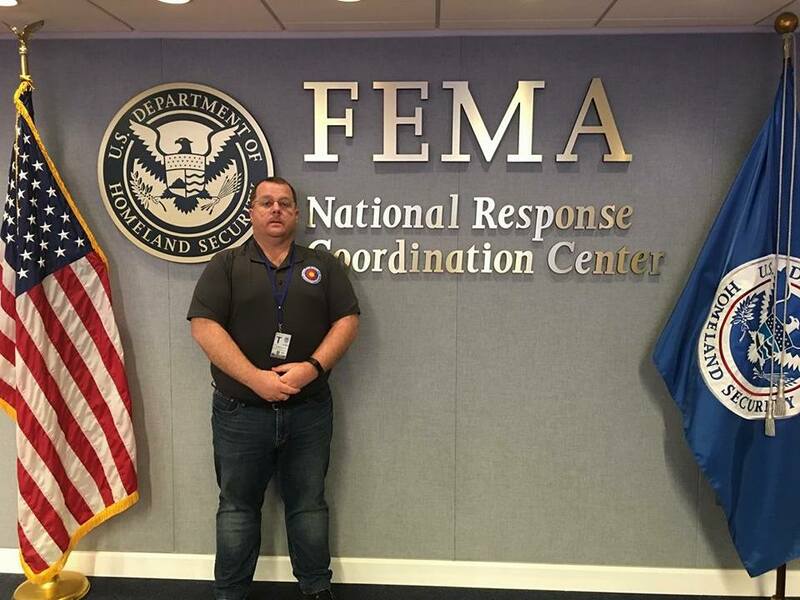 First, Logistics Section Chief Jeremy Utter deployed to the National Response Coordination Center in Washington, D.C., in anticipation of Hurricane Harvey. He served as part of the National Emergency Management Assistance Compact (EMAC) Liaison Team. EMAC is a mutual aid agreement between states and territories of the United States, which enables states to share resources during natural and man-made disasters. Jeremy originally deployed for Hurricane Harvey coordination and held over to support Hurricane Irma. He worked with state and federal agencies to provide resource support to impacted states and territories. Colorado Emergency Management personnel ready to deploy to Florida. Then, on Sept. 9, DHSEM coordinated the deployment of 24 emergency management professionals from various agencies across Colorado to Florida. The 24 individuals broke into four teams to provide emergency operations center (EOC) support Florida as part of an EMAC request for Hurricane Irma. The team included the following DHSEM employees: Field Services Manager Bruce Holloman; Regional Field Managers Christe Coleman, Kevin Kuretich, Drew Petersen and Cory Stark; and Logistics member Tim Washington. The Colorado contingent on site in the Florida Keys. While deployed in the Florida Keys, the Team supported Monroe County and the Florida Keys with plans for Debris Management, Critical Infrastructure Restoration, Re-entry and Short-term Recovery. 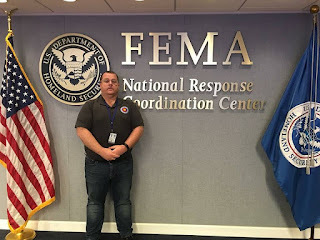 Additionally, DHSEM field services member Nate Whittington deployed to Puerto Rico and the U.S. Virgin Islands as part of the FEMA Disaster Medical Assistance Team. Nate assisted in setting up a Field Hospital on St. Thomas and supported coordination efforts for the evacuations of Critical Care Patients from the Virgin Islands to Puerto Rico. Emergency responders' work doesn't end when the storm passes, however. As of Sept. 22, fourteen Colorado responders continued to be deployed in Florida. Meanwhile, DHSEM's Recovery team members have mobilized to assist with the long process of helping communities recover. Jaclyn Kurle and Robyn Knappe are serving with the State of Florida and assisting with the response and recovery from Hurricane Irma. Their first assignment was to staff recovery alliance meetings with 100 people, including 80 teenagers who are providing clean-up and muck-out assistance. The Colorado team is also working the national emergency grant that employs displaced workers after a disaster. Robyn Knappe and Jaclyn Kurle. And every disaster response has a hero behind the scenes who is helping to make it all possible. DHSEM's Denise Popish supported these efforts from here in Colorado, taking care of details for various EMAC deployments over the past two weeks. Denise worked an unbelievable number of hours (day and night) to coordinate travel, lodging, documentation and provide instructions about the reimbursement process for Hurricane Irma, as well as working through state-level reimbursements for Hurricane Harvey and EMAC deployments supporting California flood recovery. Check out this real-time map of where Colorado emergency responders are deployed and providing assistance!